Taxonomy is the science of classification. As such it’s useful for ordering items within a domain into different categories. Contrary to popular understanding, although taxonomies can be hierarchical, they don’t have to be so. In education, the word ‘taxonomy’ is most closely associated with the prefix, ‘Bloom’s’. As every teacher knows, Bloom’s Taxonomy is a triangle with ‘knowledge’ at its base and ‘evaluation’ or ‘creativity’ at its apex. In fact, Bloom’s Taxonomy is not just a triangular diagram, it’s actually an attempt to classify different thinking skills. The triangle has simply come to represent the taxonomy. The educational psychologist, Benjamin Bloom, who developed the first iteration of his taxonomy in 1956, saw knowledge as the basis, the foundation, of all thinking, not as a category of thinking skill but as “the necessary precondition for putting these skills and abilities into practice.” This is presumably why, in the diagram it is placed at the base of the triangle and given an area larger than all the other areas. The problem is that when we see a triangle, a trick of the brain forces us to see the apex as representing something higher and more sought after than the base. This fallacious understanding has led educationalists to conceive of those skills at the bottom of the triangle as representing ‘lower order’ thinking whereas those at the top are seen as ‘higher order’. The consequences of the misapprehension have been dire. Over the past six decades, ‘mere’ knowledge has been denigrated as something to be rushed past and superseded as soon as possible, and analysis, synthesis, evaluation and creativity have been lauded as the aims of any right-thinking educator. While this was no doubt well-intentioned, the rush to develop students’ analytic and creative skills has had the unintended consequence of making them less knowledgeable. The problem is that thinking skills cannot be meaningful practised in the absence of something to think about. My contention is this: You cannot think about something you don’t know, and the more you know, the better you can think. It’s certainly true that raw reasoning ability – sometimes referred to as fluid intelligence – exists without prior knowledge. As such, we can apply our fluid intelligence to problems in the environment about which we have no knowledge. But, the ability to apply what we know – or crystallised intelligence – trumps fluid intelligence. Consider two individuals: Sarah has high fluid intelligence but knows nothing about quantum physics and Tony has lower fluid intelligence but knows a lot about quantum physics. If we were to expect Sarah to analyse or synthesise different aspects of quantum physics she would have to rely on her working memory to hold all the new information in mind while simultaneously trying to think about it. There’s no doubt that Sarah would be able to process new information more quickly than Tony if they were both equally ignorant of the subject, but because Tony knows a lot about this particular subject he can access long-term memories to overcome the limits of working memory which will mean he has more room in his consciousness to think analytically and creatively. If both Tony and Sarah were given the same task, Tony’s performance would be superior. Because thinking skills require knowledge, they don’t exist generically. There’s no such thing as the generic ability to be analytical or creative; you can only analyse some thing or be creative in a particular field. It therefore makes sense to re-imagine Bloom’s taxonomy so that it better represents the types of thinking we might want our students to be able to perform. I read Doug Lemov’s post on the problems with the way Bloom’s taxonomy is perceived and saw he’d proposed a new way of representing the taxonomy. Long-term memory contains what we know. I’ve separated this into things we know we know – declarative knowledge – and things we don’t know we know – non-declarative knowledge. The ‘pillars’ flowing between long-term and working memory represent our different cognitive abilities. They’re also, you may have noticed, the trendy 21st century skills we here so much about. Blue pillars are – I think – mostly declarative, while the green are mostly non-declarative. The turquoise pillars are either a bit of both, or ones I wasn’t sure about. 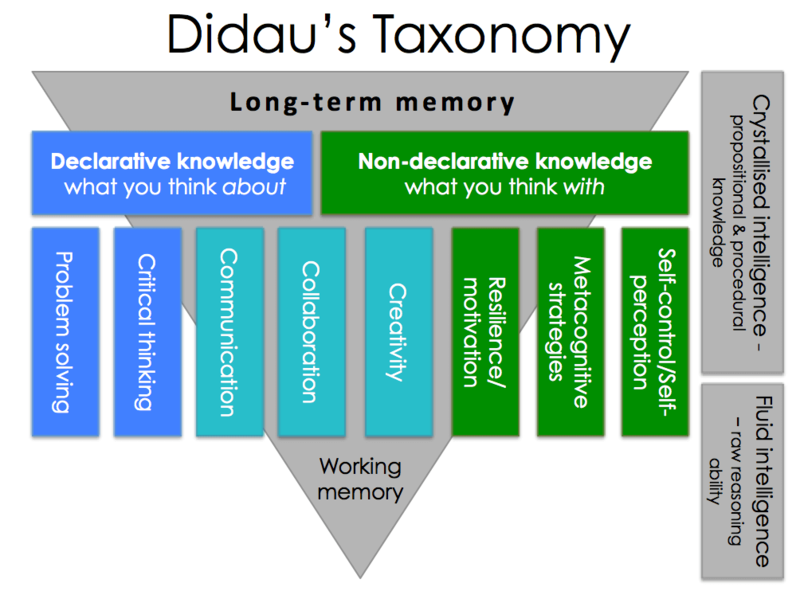 Working memory – our capacity to hold new information from the environment and process it with information retrieved from long-term memory – is the point of the triangle because, well, working memory capacity is constrained. It also suggests that this is the point at which we act on the world. Long-term memory is the inverted base of the triangle to reflect the idea that long-term memory – and with it our crystalised intelligence – expands as we know more. No doubt this needs some work, and I’m certain it won’t please everyone, but I think it might be a small improvement on the triangle. At the very least it clearly represents how different ways of thinking interact with what we know. Finally, a plea. Even if you think this diagram has descriptive power, please, please resist the temptation to put it in a lesson plan. This sort of thing should never be prescriptive. David, I thought categories were also described as hypernemic hierarchies, with the more abstract term at the top, and the more concrete lower down. Thus: furniture, table, desk, school desk. As in the system created by Linnaeus to categorise plants and animals. If not this, then how do you conceive of categories other than hierarchically? I’m genuinely interested. In your model, I think I saw something else other than categories. Although there were no arrows suggesting a process, I thought there was an implied dynamic between LTM and WM (which there is). This is a reoccurring challenge in creating models: how to integrate two different structures. An in-person conversation, clarifying and sketching out various options would almost certainly arrive at a satisfactory (unambiguous) model. You want arrows? How would you redesign it? Also, I don’t know what hypernemic means. If you’re using hierarchical to talk about connectedness, that’s fine. I’m objecting to the idea that classification suggests one thing in a taxonomy is more or less valuable than another. Sorry about using that word without explaining it (I was on my phone). A hypernym is all about superordinate words and concepts (David Crystal is great on this topic). So, in my example, furniture is ‘above’ table, and that above ‘desk’ (a mere type of table). That’s how taxonomies work. However, being ‘above’ does, I admit, give the impression that it is more important, rather than just more general. As we tend to assume top is more important than bottom, and left earlier than right, a radial arrangement is often used to avoid these misinterpretations. The point about the arrows is that I think your diagram attempts to cover both a definition (the categorising does that) as well (this is my guess) a process (the movement to and from LTM to WM. I wouldn’t want to redesign your model without having a conversation with you, sketching out possible options and checking with you, there and then, if it accurately represented your conception. Maybe one day. I went through a fairly typical process with Blooms in that I accepted it with an embarrassing lack of scepticism during my training, almost immediately found a disconnect between the promise and reality of its use (actually working to ask 7 questions in sequence rising through the strata! ), binned it and encouraged others to do the same before reevaluating, noting that knowledge was there all along as the true ‘foundation’ of everything else. It still raises the question of ‘what is a model for?’ however. No doubt yours is supierior to many (this example still floors me https://www.google.co.uk/amp/s/atruenorthmsteacherblog.wordpress.com/2012/06/25/the-power-of-metaphor/amp/) but there still exists a complication in that every elements requires more and more refined explanation and justification for inclusion. I make no claim that this model is useful – just that it is descriptive. I dread to think that it might one day appear on someone’s lesson plan! That would be in keeping with the ‘generation effect’: creating a model makes you remember it better. Unless you’re thinking of Resilience as something akin to a habit, where guess it might fit under “knowing how” rather than “knowing that’s. I think resilience is very much context dependent and that context will certainly include habit and prior experience. As you see, I put it under non-declarative knowledge which implies I think it’s something you think with rather than about. David – I too have a problem with resilience/motivation and feel that it really doesn’t fit. It is not a form of knowledge nor is it something you do with knowledge. Furthermore, I see it more as a trait than a state and as such not readily influenced. Why do you think resilience is not a form of knowledge? If it’s a trait, what does this mean? Can traits somehow be something we don’t know? As someone who has used the revised Bloom’s taxonomy to encourage teachers and TAs to use more challenging questioning with all children, whatever their prior attainment or ‘potential’, I find your suggested taxonomy persuasive. I remember one colleague in Newcastle several years ago saying that ‘Remembering’ (ie knowledge) is the easiest aspect of thinking ….. unless you’ve got a crap memory. How very true. I’ve also found the Solo taxonomy useful, especially through an entertaining and informative Youtube video applying it to Lego. Thanks David. I will have a look later and see how it affects my thinking. I think it’s probably a step in the right direction for us even to be engaging colleagues in the debate, as I’m finding that a lot of this stuff is new to the vast majority of TAs, and beneath the radar of many of the teachers with whom they work. I admit to being very influenced by Chris Quigley’s thinking, having worked with him in the past. I certainly recognised aspects of Solo from my own work as a primary teacher and school leader, although I now have time to grapple at a much deeper level with all of this ‘theory’, and it scares me how little I knew when I was working in one school trying to deliver and improve an excellent education, rather than providing training and consultancy as I am now. I’m a little confused – isn’t “non-declarative” knowledge “procedural”? In wnich case, all the skills would require both types of knowledge. Surely problem-solving and critical thinking are both reliant on procedural as well as declarative knowledge? And is Bloom’s Taxonomy not a hierarchy because the top end reflects a more valuable form of thinking than the bottom, although I take your point we can’t skip the knowledge bit? 1. Procedural knowledge can be declarative or non-declarative. Reading a bike would be non-declarative whereas writing an essay would contain much more declarative knowledge. I think you might be confusing declarative with propositional knowledge (which overlaps a lot) – basically, all propositional knowledge is declarative as is some procedural knowledge. Therefore, you would right to say that problem solving requires both procedural and propositional knowledge, but that’s not contradicted my my diagram. 2. I dispute that evaluation is more valuable than understanding. We analyse in order to understand. We evaluate so that we can apply etc. 1. Thanks – I think maybe I am confusing knowledge with models of memory because my understanding was that procedural memory is implicit by definition, but I recognise that it’s more complex than that, and what was explicit can become implicit. Is your diagram reflecting more a matter of emphasis in regards to declarative/non-declarative? 2. I see what you mean – I hadn’t thought of it like that. “I’ve never had to invest significant time in exercises to build understanding. It is because when my children are given a new sort of problem they can already calculate the separate parts of that problem automatically. All their working memory is focused on the only novel element of a procedure and so it is very quickly understood. Understanding is just not a biggy. Identify the knowledge necessary to calculate the component parts of a problem and get fluency in those and generally activities for understanding become a (crucial but) small part the maths diet. This has terrifying implications for the profession. Teaching declarative and procedural knowledge is relatively simple, given that the teacher possesses that knowledge. This, I suggest, is why educators’ fascination with analysis, synthesis and evaluation won’t go away. You think teachers like analysis *because* they struggle to teach it? When teachers fail to teach higher-order skills, you may be sure that they will trot out all the usual excuses about poor parenting and social disadvantage. I should think this attitude is more common in primary schools, where most teachers are subjected to 3 or even 4 years of indoctrination, but it is by no means absent from secondary education, where the surest way up the professional ladder is to accumulate post-graduate degrees in education. I agree with yr sentiments about the old Blooms pyramid in terms of hierarchy. It does seem to imply that the higher levels are more important. However if you relate it to a food pyramid diagram (or even a real pyramid) you could say that the lowest level has a greater emphasis in quantity or time. For example in the food pyramid grains and cereals at the bottom are much healthier (and should be eaten in greater quantity) than sugar at the top. So maybe we should see the top layer not as being more important but needing less curriculum time. This is borne out in practice in schools. We do spend more time teaching knowledge than say evaluation or creativity. The highest level might be viewed then as a destination, we That we should spend more time on instilling knowledge in order that you can synthesise it at a later date as you suggested. Perhaps if they turned the pyramid on its side it would make more sense (at least for those of us who read from left to right). But then I’ve never really used the Blooms pyramid much anyway. Bloom always admitted his model was incomplete didn’t he? And educationalists have been cherry picking that one section and misrepresenting it ever since. Personally I always preferred Anderson and Krathwolds revised model myself and I created a model for Art using it (based on something I’d seen from Ohio State University Science department) that I’m happy to email if yr interested. Unless you live in 2D flatland in which case a higher dimension object like a pyramid would be perceived as its 2D form. 1 min 20 s explains the relevant part but the whole 11 minutes is interesting. I really enjoy the strange voive-over and sound effects. Alternatively he just used the wrong name. I think what you’ve done with your taxonomy is great (as always), but I’m just not sure I agree with your reasoning and in any case, I’ve always been secretly angered by many SLT’s continued misuse of Blooms. As you know, The TRIANGLE so commonly used by teachers misrepresent his and subsequently modified (by others) intentions. 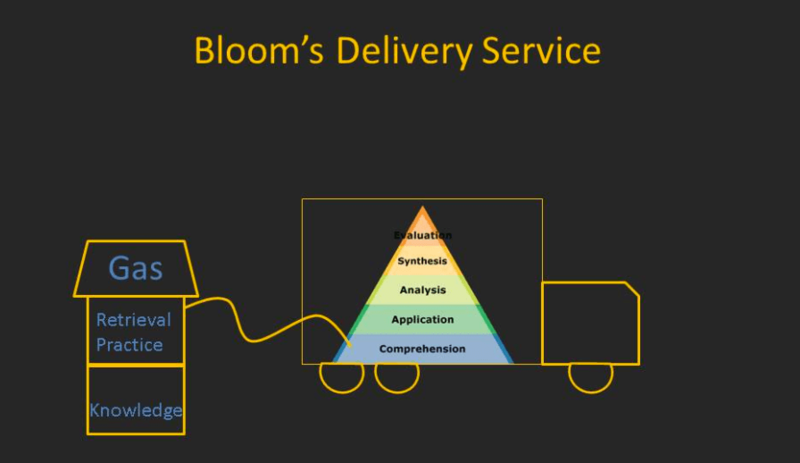 If used correctly, ALL of the Bloom’s objectives are Knowledge based objectives and have NO hierarchy. The revised Blooms model as a six sided flower therefore is far superior to the triangle though the best models in my opinion use Remember rather than Knowledge and use Comprehend, Apply, Analyze, Evaluate, Create/Synthesize in no hierarchical order. The appendix to Blooms has a definition of knowledge which is quite important as a summary classification of educational goals. You will be aware that the six objectives commonly banded around as Blooms are only referring to his Cognitive (knowledge based) domain. Few schools also use the Affective domain objectives and fewer still use the Psychomotor domain objectives (which Bloom didn’t complete and are skills based). In this way Declarative Knowledge is really the same as Applying and Analysing. Non-declarative knowledge is the Affective domain outlined by Bloom and subsequently revised. Because, if used correctly, the six Blooms learning objectives is all about knowledge. Anyway, nice to read your blog and I am hoping to get to hear you speak in June for Osiris. Is ‘understanding’ an emergent property? Ah ha. ‘Understanding’ appears to collapse into a consideration of the sophistication of the individual’s framework of knowledge. I’m not a teacher but having seen the pyramid many times and the credence teachers seem to give to it I have looked at it and found it rather curious. I have always thought/felt that since the rectangle at the bottom was the largest then this suggested that this was were teachers should spend most of their time. That is, most class room time should be devoted to the acquisition of knowledge/facts. Yet, as you point out, our brains trick us into thinking that the top is what we must aim for and the faster we get there the better. Hence, perhaps why too many teachers have scrimped on the knowledge part and tried (unsuccessfully) to skip to the skills part by attempting to teach generic skills. Great post thanks. I’ve always thought Bloom’s was b*llocks in the way that it was interpreted – I worked in a school where “pitch high” was the mantra, and any learning objective that was lower than “analyse” instantly earned the teacher a dressing down from SLT, no matter whether the material being taught was completely new to students. It was madness! Coming from a building background I tend to see things a little different, I view the base as the foundation an which every thing is built. In this case the foundation of knowledge is important in that if the knowledge is incomplete or corrupted through bias or belief then all that is built on it will be flawed. I have observed a trend in the knowledge base today to use imperial data and ignore empirical data. This has been done mainly by people who are more interested in controlling how people think, than whether they know about what they think. Observable facts are ignored that contradict with chosen paradigms which leads to stagnation of progress and social decay.